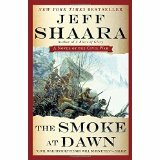 Jeff Shaara’s new series of Civil War novels includes A Blaze of Glory (the Battle of Shiloh; 2012); A Chain of Thunder (the Siege of Vicksburg; 2013); The Smoke at Dawn (the Battle of Chattanooga; 2014); and The Fateful Lightning (Sherman’s capture of Atlanta and his march to the sea; 2015). The Smoke at Dawn begins with the Battle of Chickamauga, the worst defeat suffered by the Army of the Cumberland. In Chapter One, as Union soldiers retreat out of north Georgia back toward Chattanooga, Nathan Bedford Forrest berates Gen. Braxton Bragg for his refusal to pursue the enemy ruthlessly, thereby losing a great opportunity for the Confederate army. With the Union army bottled up in Chattanooga by a siege that threatens its starvation, Ulysses S. Grant, the victor at Fort Donelson, Shiloh (with Buell’s help), and Vicksburg, is elevated to the lofty position as commander of the entire region west of the Appalachians. It will take Grant’s expertise to help the fly escape from the fly bottle. The forty-one remaining chapters of this novel alternate between principals of both North and South—for the South, Nathan Bedford Forrest, Braxton Bragg, and Patrick Cleburne; for the North, George Thomas, Private Fritz “Dutchie” Bauer, William Tecumseh Sherman, and Ulysses S. Grant. Breaking the siege, the Union forces launch a three-pronged attack: a successful capture of Lookout Mountain (“the battle above the clouds”); a vicious fight at Tunnel Hill that ends in a virtual stalemate; and the triumphant attack on and breakthrough at Missionary Ridge. In his inimitable style, Jeff Shaara combines the historian’s diligent research with the fascinating creativity of the novelist. We learn much more than the dry facts recorded in history books (the who, what, where, when, and why); we are given insights into the various characters’ thoughts and emotions. Surely the best contemporary novelist writing about the Civil War, Jeff Shaara presents first-person, present-tense accounts of the various strategies and tactics: “I am thinking and feeling thusly,” rather than “He thought and felt thusly.” Such a dynamic methodology infuses his narrative with an engaging immediacy. You are currently browsing the Underground Nashville blog archives for November, 2015.